With the launch of a new sport fishing store, we highlight the most wanted brands, hot fishing spots and free workshops. 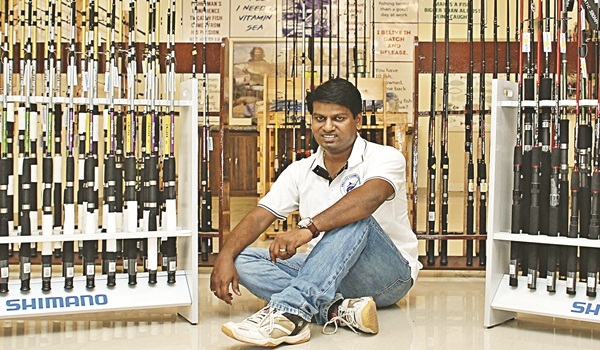 Talking about accessories, Kumar claims that one can find just about anything at this store, from reels and poles to hooks, lines and sinkers. a�?As of now, we have all the best brands from Singapore; therea��s Shimano, Surecatch, Mustad and Alko among others. We also have the top model reel by Shimano, called Stella (Rs 90,000), that most professional anglers use,a�? he shares. Stella uses the X-ship technology that improves gear durability, making it easier to spin the reel. It enhances the performance of the reels in terms of faster and longer casts. The best seasons for angling according to Kumar is between May-July and December-February and he admits that the demand for tackles is high during that period. However the walk-ins reduce drastically during off seasons, with sales limited toA� online purchase from Mumbai, Goa and Kerala, where the angling season is still on. Kumar has bigger plans, and hopes to open a complete adventure sport accessories store next year. He will stock equipment for camping and other outdoor adventure sport activities, he promises. Angling trips and workshops are also on the cards. a�?For now, we are conducting workshops on weekends at the fishing harbour, for anyone who wants to learn angling. I will be teaching them everything from how to use the rod, how to reel back the fish, how to handle a fish once ita��s caught and how to unhook it and release it into the water. We believe in the catch-click-release method. This workshop is for anyone above the age of six years and it is free of cost,a�? says Kumar. For angling, the set of accessories might be the same, but the size and types vary based on: freshwater or river angling (fishing in a pond or lake), sea angling (fishing in the seas) and carp angling (a kind of freshwater fish like rohu, catla and pangasius). For sea fishing, Kumar explains, the rod must be strong enough to be able to catch even a fish of around 400 kg or above, like a marlin. The rods for sea fishing and freshwater or river fishing differs, as it does for carp fishing. The freshwater fish weigh not more than 15 kg. The other thing that an angler should keep in mind while choosing his equipment is the size of the line. For example, while fishing in a small lake the line could be just 100 m long but while fishing in deep sea, the line needs to be 500 m or longer to make sure that the fish has no escape. I have been angling from the age of 22, I am a swimmer and I love the waters. In angling, every day is another discovery. For me angling is like meditation, I go fishing every week.